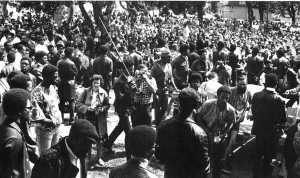 BLACK COMMUNITY ORGANIZING RALLY AT BOBBY HUTTON PARK, 1968 OAKLAND CALIFORNIA. B.P.P. Field Marshall Landon Williams walking with walkie-talky in hand. Contents copyright Bobby Seale c/o Reach Cinema Productions, Inc.